Whether you are a beginner, an advanced handler or just want to see if your dog has instinct, Draxen Farms is the facility to fit your needs. 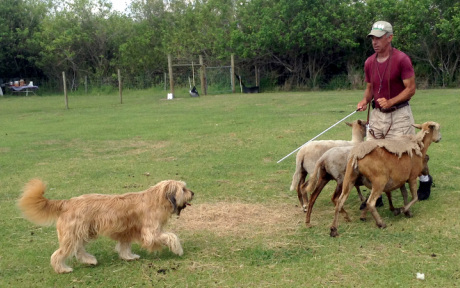 Beginner handlers will start off in a round pen with the instructor and sheep that are accustomed to working around many types of dogs. 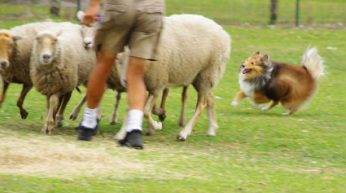 As you advance, you can move into larger areas with sheep that are suited to your dog’s ability. Here on the farm, our classes are conducted in a group setting, as each dog needs time to rest after their turn working. This also gives each beginner student the opportunity to observe while the other dogs and their handlers are working in the round pen. We work each dog three times during the training session which typically lasts between two to three hours. So when you come up to the farm, be prepared to relax in a country setting while your dog works the stock. and on Sundays from 11-3pm. All classes and instruction are by appointment only! Only ten student slots are available each Saturday and Monday, and only 5 student slots available on Sunday. So please call in advance. Advanced handlers are welcome to work on their own and do not take up any of the beginner student/round pen slots. Call for rates and to make appointment. Sturdy Shoes, Cooler with drinks and snacks, a standard leash and water/bowl for your dog.